You're using an old version INTERNET EXPLORER, this type of browser is not supported. Please update your browser or use an alternate browsers. recognizes the global need for employment. is the Philippines' leading recruitment company. If you need assistance, Please Log-in your account. Since its inception in 1993, the company has deployed thousand of worker and to date, has been consistently ranked by POEA having the highest deployment of any recruitment company in the country. 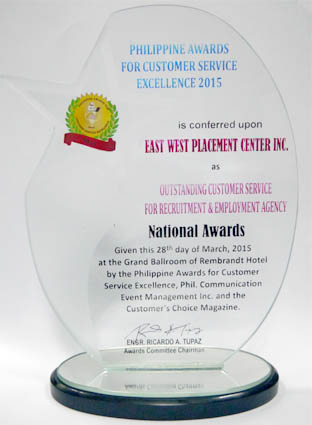 Given by Philippine Awards for Customer Service Excellence held in Hotel Rembrant on March 28, 2015. 2005 Top Performer award and the Special Commendation by the POEA "for pioneering and sustained efforts in the electronic system of submission of contracts (E-submission) resulting to a faster and efficient documentation of overseas Filipino workers. The award was conferred on January 31, 2006 at the Manila Pavilion Hotel, Manila. Most Outstanding Overseas Placement Agency for Skilled Workers by the Philippine Quality Awards for Business Excellence. The award was conferred on January 30, 2006 at the Hotel Intercontinental in Makati City. Most Outstanding Engineers Placement Agency by the Philippine Marketing Excellence Awards for "undertaking best marketing practices leading toward market dominance, goodwill, high-level customer confidence and market acceptability." The award was conferred on November 14, 2005 at the Westin Philippine Plaza Hotel, Manila. Top International Placement Center in the 2005 Brand Champions Awards. The award was conferred by the Product Equity Research and the Brand Champions Governing Council on October 8, 2005 for demonstrating the highest standard of brand excellence. Job Opening for Al Ajial Factory Co. Ltd. [AJI-01L18-E1].. I just want to show my gratitude to eastwest for being one to cope up my dreams to be in line at my future will. May you continue your good will to help other filipino. Thank you. SO thnankful for East West it was never a reason for being a first timer. From a steel fixer to regional HSE Assistant.. Thanks to them..More power and God bless East West More...Change for the better..Salue!!! ...Good leadership... Good management... That made #EastWest #Placement #CenterInc no. #ONE Company... #CONGRATULATIONS for 22yrs of service... More power! For your COMMENTS and SUGGESTIONS. Tell us what you think about our web site, our organization, or anything else that comes to mind. Copyright © 2016 East West Placement Center, Inc. All rights reserved.